Lead Nurturing - We Just Met Will You Marry Me? Would you ask someone to marry you on the first date? Of course not…at least most of us wouldn’t. So why would you expect someone to buy from you on their first introduction -- especially when they’re just entering the lead cycle or doing basic research on a topic when you appeared in their search results. 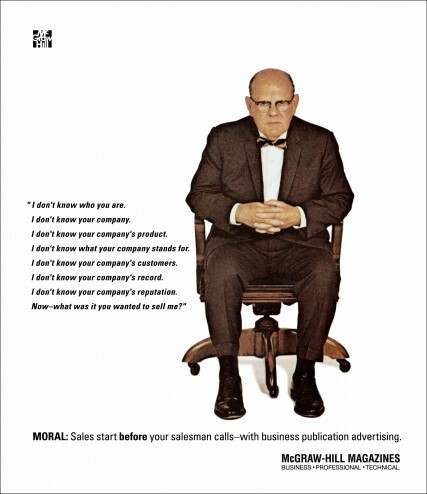 MORALE: Sales Starts before your salesman calls- with business publication advertising. MORALE: In simple, plain English, lead nurturing means engaging with qualified leads until they are ready to make a buying decision. How Does lead nurturing help close the sales cycle these days? Remember that first date? Walk before you run. You get people to subscribe to your newsletter, read your blog, download your whitepaper, watch a video tutorial, take a demo and many other types of activities designed to help your prospects through the sales cycle. Once you have a lead, you don’t try to sell anything until you figure out that the lead is “ready” to make a purchase. This process allows for a prospect or leads to mature, you’ve provided value to your lead by giving them more useful information, case studies, informative videos and other types of content through their journey. So why do you take all this time and effort to develop and deploy all types of content? Simple; it’s part of the new sales process and how customers and prospect buy today. This helps your customers develop trust in your brand and overcome the barriers to make a sale. Everyone has a number and there are there are a lot of percentages doing the rounds on the internet regarding how much % of people are not yet ready to buy from you the first time they land on your website -- 70%, 85%, 90% just Google it! The truth is that majority of your prospective customers will never buy from you the first time they come to your website. That’s where lead nurturing comes into play. So what’s the Net, Net? You need to establish lead nurturing techniques to get website visitors onto your list, build a good relationship with them and when you think they are ready to make the sale, present them an offer. You’d be surprised at how many people will convert to a paying customer when you adopt this strategy. One of the biggest challenges facing small and medium size businesses is generating revenue from website visitors who may not yet be ready to purchase services immediately. In fact, studies have shown that 50% of visitors are not ready to buy when they first come to a merchant’s website, and that 80% of leads never convert into sales due to poor communication. That’s why an effective lead nurturing program can increase sales by 20%-30%. Consistent and strategic content development and lead nurturing communications are critical before you can effectively market to your existing leads and prospects in your pipeline and you must find innovative ways to drive meaningful traffic to your website and then nurture them though their journey. You should have a series of automated lead nurturing programs if you expect create value offers that will help you drive traffic and build up your database of leads. If content is king then lead nurturing are the knights of the roundtable. So you’re starting to drive leads to your website and understand they may not be ready to buy on the first visit. The obvious objective is to convert these web visitors into leads and capture their information in a contact form, typically based on a relevant, optimized content offer. IMPORTANT: Make sure your offers have real value -- give your site visitors a reason to register their contact information. This could be a free consultation, video tutorial, demo, eBook etc. Once the web visitor has been converted to a lead via a registration process you can start to implement your lead nurturing process and move this visitor through the sales pipeline. Whatever you do, don’t start to bombard your leads with irrelevant email blasts. Email is already broken and let’s face it, how many interruption marketing emails are already in your inbox that you simple cannot address. In order to keep prospects on your email list and to get them to open the emails and maybe even click through and convert, you need to get creative. Make sure that your emails are written and designed for conversion best practices. Try to keep the email content short and witty, with subject lines that are to the point and easily defined calls-to-action that give your prospects a reason to move through the sales funnel. And keep it fun and interesting! Don’t worry about coming across to casual. It’s much better to err on the side of casual and fun than boring and stiff. The kinds of emails that nurture leads include welcome emails, auto-responders, recurring campaigns and RSS/blog subscription. Consilium's approach to lead nurturing is an inegral part of the inbound markeing process is built on parallel approaches of evolutionary marketing and new markets. Call us today to discuss whether our unique approaches and business development consulting expertise are the right match for your corporate strategy and objectives.